In the evening we went to the movies to see Alice in Wonderland in 3D. Two big cabs came to the shelter to pick us up. There were 10 girls, Linh and I. The girls were impressed with my dress, as I never wore dresses to our classes, but today I decided to dress up for them. We came to the CT Plaza, walked through the luxury mall and finally took the elevator to the 10th floor to the cinema. The movie started and we all entered the world of magical Wonderland. The girl who sat next to me was squeezing my hand, as we both were scared of the “bad creatures” jumping into us. Our seats were very close to the screen so it felt like the stereo effect was even stronger. The girls were laughing and talking when they watched funny moments of the movie, as it was there first time experiencing 3D. I thought that I had 11 Alices with me – sincere, kind, generous, beautiful inside and out with rich imagination. I want them to stay that way and have happy lives. We took pictures outside the theatre and went back to the shelter. As I was sitting in a cab and listening to the Vietnamese music, watching the lights of Saigon at night, I realized that I finally see the city the way locals see it. Linh and I walked to the store to get some cookies for the girls who didn’t get to go to the movies (as they go to school in the evening). There are 18 girls in total at the shelter. We came back and chatted with the girls, ate cookies, then took more pictures. And there came the hardest moment, when I had to go. I gave them all hugs, including Miss Yen, and asked them to promise to write me letters and send pictures. As I was leaving the shelter on a motorbike, I felt sad as if I was leaving my own family. Deep inside I was crying… Now I know what Carrie meant when said that those street children in India stole her heart. Though sad, I was sure that it is not the end of our friendship, as we will keep in touch… I’m leaving them now but I will be present virtually, and keep helping them with learning and life questions as a friend and mentor. I drew on the board a grid for 6 girls and 6 questions and would put a check mark every time they say they finish a task. For the first question, they immediately opened database of maps on their XOs and found Boston on the map of North America. Every one successfully found info on Phu Quoc on vi.wikipedia.org, translated it to English & emailed it to me. Earlier that morning I emailed the girls a digital book. The last task was to take a picture. Truc didn’t want to take a picture of herself so I told her to take a picture of Andy and Loan. She did and sent it to me by email. They finished all of the questions in about 30 min, some even quicker… Last task was a bonus, but they all did it. The judges were sitting at the other end of the table and conversing quietly, which was good. When the exam was over, they told me they have something for me. I didn’t expect anything. I got a framed heart of the girls in the orphanage which says “We love you!” I said I will put it in my room in Boston and look at it every day! The teacher made a speech which expressed that she was very thankful for what I did and computers and that they will always remember me. So finally the moment of awarding the Teacher Certificates came and I started the ceremony by calling Hanh first, she is the oldest. I shook every girls hand and gave her a certificate! They were impressed. Then I said that now they qualify to teach other girls in a shelter, so they all know how to use the Internet, play games and do other things on the XOs. I also announced that I’m leaving my teacher XO at he shelter for them as well. They asked who am I leaving it for and I said for all of them to share between 18 girls! And finally I’ll be coming to pick them up at 5:45PM to go to celebrate tonight! Andy gave me a ride to the CT plaza where I bought 12 tickets for the movie tonight, which cost about $75. Minh came to translate today. When we entered the classroom, the girls were working on their XOs: two were copying down words from their favorite songs from the Internet and others were either checking their mail box’s or playing games. The first thing I wanted to accomplish today was to test Vietnam XO/Sugar User Group. I sent an invitation to all the girls to become my friends on FB. They asked me what kind of questions will be on the exam? I told them general categories and announced that the exam will be at 9AM tomorrow. We confirmed that all 6 girls will be present for the exam and the celebration. As we were driving back to the Peace house after the class I decided to do something nice for all the local volunteers who helped me in the last several months with translation, so I thought of a roof deck party on Sunday, the night before I leave Saigon for Hanoi. So I Invited Minh and other local volunteers to come to the Peace House as I’ll be making Russian salad for all of them to try. The amount of work to be done today is enormous… I had to find or create and print out Teacher Certificates for the girls. It was very important as I promised it to them from the beginning. Having credentials would empower them as individuals. The next thing was to get the teachers’ approval to invite the journalist to the exam and to have a celebration probably on Thursday evening. What kind of celebration? I need to think of something special: ice cream outing or movies? … I also need to create exam questions… And choose and invite the judges… Where do I start??? I e-mailed Nancie asking if she could forward to me the template of the Teacher Certificates, she gave out to the teachers in Hanoi. Fortunately, Nancie responded immediately, referring me to her assistant in Hanoi, named Nguyet, who emailed me the templates right away. Even though I don’t have Corel program on my computer, I went to the printing shop nearby and made them customize the template for Saigon and print out 6 certificates , as I knew exact names and birth dates of the girls. Everything was done in 2 hours and for $3. 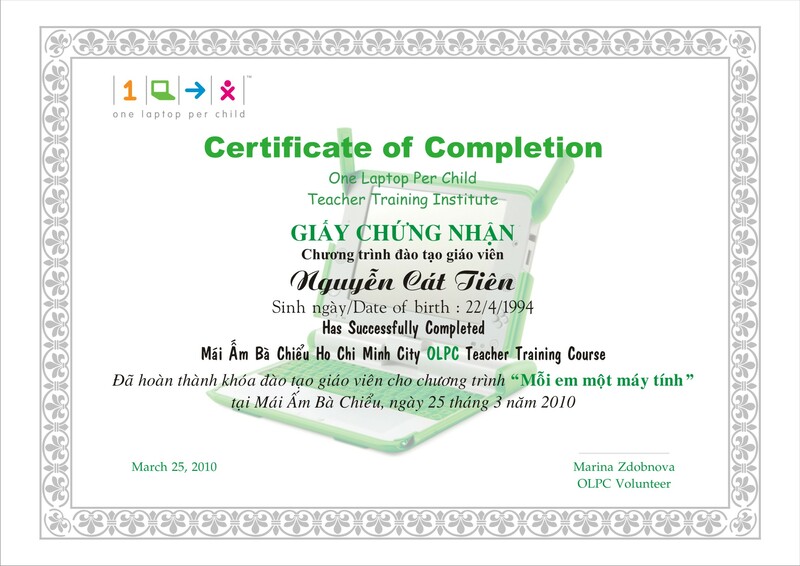 The certificates looked very cute and were bilingual – English and Vietnamese with a cute green XO in the center. Next step, I contacted Andy and asked him to ask his friend who works for the Saigon Times if she is available to come to the exam on Thursday. She said she could do it in the morning at 9AM, which was perfect as we would have free time in the evening on Thursday to celebrate. Andy rode his bike to the shelter to ask whether 9AM was good and all the girls would be present, then if the journalist was allowed to come, and lastly, if I could take the girls out to the movies. He came back and said that celebration is OK, but it would be unfair if I only take 6 girls to the movies, the others will be sad. Then I decided I would take all the girls to the movies. I thought it would be great to see the new Alice in Wonderland in 3D. We clarified how many girls would be around at 6PM, and were told ten. Perfect. I would need to buy the tickets on-line in advance as they sell out quickly. 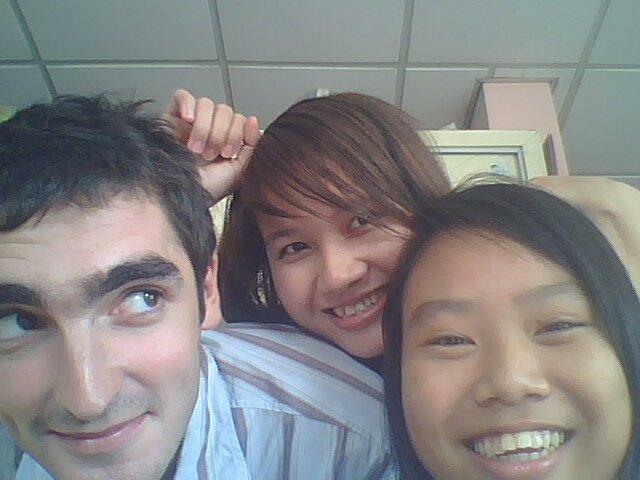 I invited Mathieu (France), Andy (UK) and Sam (USA), who will be teaching English to the girls after I leave. Mathieu coudn’t come, but Andy and Sam agreed to “work” as judges during the exam. All I wanted is their presence to make the exam look more official. Then I had to create the exam questions. I planned to showcase their skills with XOs and do it in one hour. So about midnight I created 6 questions (see next post) . Lastly, I was searching online for the nearest movie theater to buy tickets on-line. 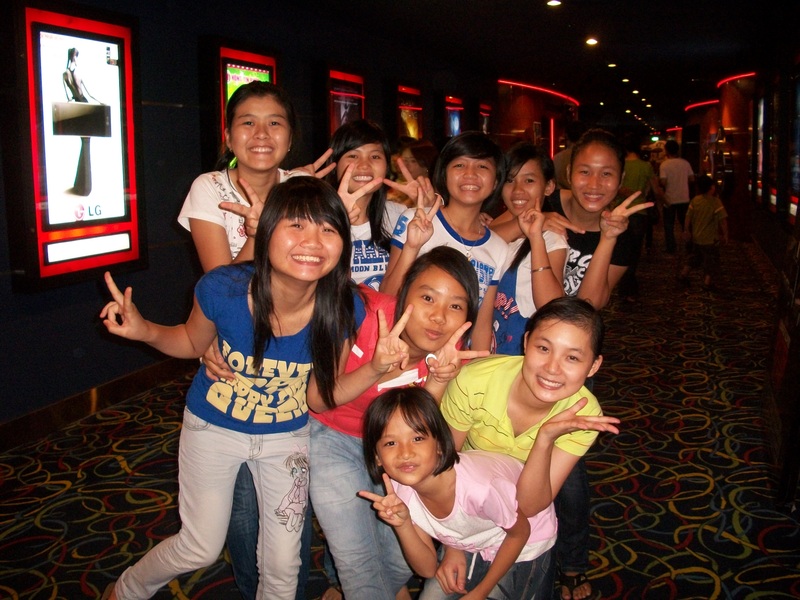 It turned out that you can’t in Vietnam, you have to go to the movie theater in advance to buy them. I would do it tomorrow morning after the exam. The teachers informed me that the girls love the computers and are happy to use them. And I knew immediately that the teachers are now interested in them, too. They don’t know how to use the XO, so I gave them a crash course on how to start it, launch activities, close them, use the Internet, and more importantly, check the journal for what the girls do. They looked super excited and empowered. Yen opened yahoo email and sent me a letter. Then I showed them picture-taking, speech, etc. We discussed viruses again and Zerlene explained that there are almost none in Linux in comparison to Windows. Yen and Thanh felt relieved. I also told them about the exam on Thursday and the judges who will come to the exam. Those who pass will receive Teacher Certificates and they will be able to teach other girls in the shelter. The teachers liked the idea and supported it completely. I also asked for their permission to communicate with children from other countries with my supervision. This will improve their English and they will learn to use discussion boards/walls on-line. The teachers asked about OLPC. I said that the organization always improves computers and its programs. That is why I taught the girls to get updates frequently; it will be part of homework assignments. People like me go to different countries to teach these computers in schools, sometimes with hundreds of children. But Ba Chieu is lucky, as they are the first place in Saigon to have 5 of these computers for free. Other schools find out and would want to have these computers too, but may have to buy them for $229 each. So Ba Chieu will become famous. At that moment Zerlene took a photo, and she said we were probably making history at that moment. We all laughed. I was so glad Lan came to translate, as she was correcting the local volunteer and helping her translate. Zerlene successfully set up a secure connection for the shelter and the teachers created a password. I already created their profiles using one general password. So all we had to do is to reset passwords, confirm accounts by email and upload pictures. They took their pictures first and added each other as friends… Several girls were still working on it, but I had to leave as it was already past 10PM. I could feel that it was a lot of progress in one day! I thanked everyone –the teachers, Yen, Zerlene and Lan. It dawned on me that I spent too much energy running daily operations of the project and completely forgot the politics. I also needed a precise translator and more time to spend with the teachers at Ba Chieu. So I brought a team with me: Zerlene who is a system engineer and Lan, financial specialist, who speaks good Vietnamese, both from CA. Four of us (including brand new local volunteer Yen ) went to the shelter. I told the Teachers Yen and Thanh that the girls came with me to help set up secured wi-fi connection, so that no one can steal it from them! While Zerlene was working on it, I inquired about the cost of the Internet. Last time they said it was too expensive to use wi-fi, how come? I thought it was free. They informed me that they pay per minute of use, which was surprising. But the teacher Yen explained that they decided to allow the children to use the Internet twice a week, probably on Friday and Saturday. They will unplug the router the rest of the time. I understand that it is their shelter and they set the rules, not me. Volunteers like me come and go, but the teachers are here to stay and keep the discipline and help the girls with their lives long-term… So I just say that it would be great as the girls need to practice, otherwise they will forget how to use computers. It is very important in life to know computers, because with such skill it is easier to find a good job. Thanh comes with another reason… “But we don’t know what they do online… We don’t know what kind of assignments they receive and send”. That was the moment when I gave them the power. I said that I’ll send them copies of my emails to the girls, so that the teachers know what the girls do. They were surprised that I’ll keep teaching the girls even after I leave and asked “for how long?” I proposed 2-3 months. The teachers were glad and told me to send the assignments to the girls before Friday so that the girls can do their homework during “home computer” class during the weekend. I said it sounds great. Then I showed to them Clytie’s email in Vietnamese, and suggested they write to her in case there are any problems with computers, they can write to her in Vietnamese, even though she lives in Australia, she will answer. I gave them my email address and said that I would write to them and the children both in English and Vietnamese (using Google translate). Three girls ran up to me and gave me hugs. I told them about the exam with several judges to attend. They were curious who the judges would be. I kept it a secret. Also we will have a celebration on Friday. Thao almost burst into tears as she is going away to stay with her extended family for the weekend, so she is going to miss the celebration. Maybe we’ll celebrate on Thursday after the exam? I wrote on the board “translate.google.com”. They tried to translate words and sentences from English into Vietnamese. And here came the surprise. I showed them print out of the letters in English from the boys in Boston. They were very curious. Beforehand I sent each girl one of the boys’ letters by email. They enthusiastically copied the text into the box of translate google and translate all letter into Vietnamese. Then I showed them the Vietnamese ebook site http://ebook.vietnamwebsite.net/index.php, and asked them to download one book from it. They had difficulties as the books were either zipped or in some other formats different from pdf. I sent one ebook to them by email and asked to open it. At the end I gave every girl a sea shell key chain from Phu Quoc island, where I was the week before. I told them to get it close to their ear and listen to the sea breeze inside the shells. We had no time for creating Facebook accounts, but I took girls’ full names and birth dates. I am going to create FB profiles on their behalf tomorrow. In the evening I found out that there is a volunteer who knows all about setting up secured wireless connections. She did it for the Peace House 2. She agreed to go with me to the shelter on Tuesday to help secure wi-fi there. Another one volunteered to go with us to help me talk to the head teacher and translate as she speaks good Vietnamese. We want to find out what is the main problem for the teachers if the girls want to browse the Internet daily?